Of all the trends that have emerged this A/W, the flurries of pink storming down the catwalks and taking over the streetstyle blogs have been by far the most refreshing. Every shade from candyfloss, to bubblegum: fuchsia to cerise welcome, we're all Barbie girls here. 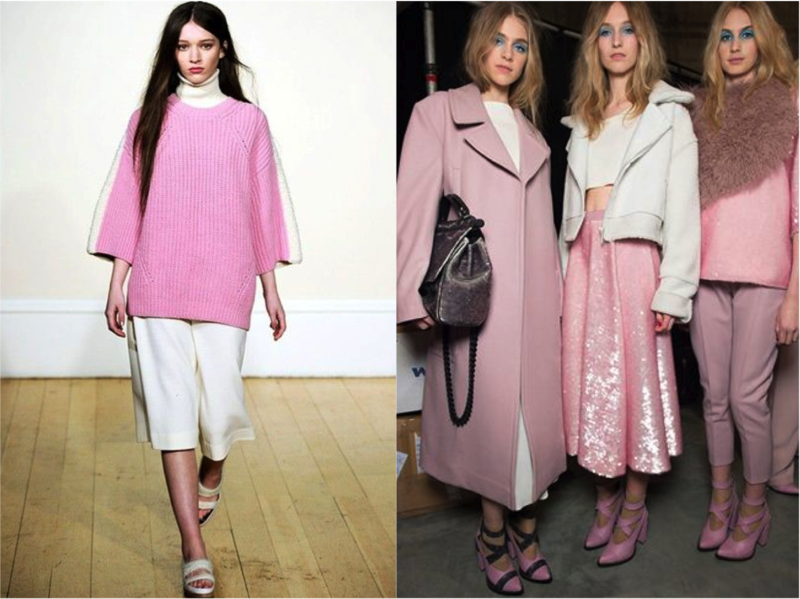 Don't be fooled however, you don't have to be exhaling rainbows and unicorns in order to embrace this trend - teaming an oversized, soft pink jumper with heavy silver wear, leather skinnies and chunky boots creates an instantly on-trend and grungey look. The powder pink coats seen everywhere from French Vogue to Topshop Unique offer a more sophisticated vibe, whereas a simple vest like the Topshop one above can be dressed up or down - with jeans, skirts or a pair of shorts and would be a perfect way to dip your toes in the pink waters. The examples I've shown above are my current favourites on the high street, although I'm sure there will be much more to come as the new season items trickle in. The two jumpers are highest on my wishlist - you can't beat a cosy knit to throw on in the colder months and both will act as statement pieces to instantly update your wardrobe. I love those pieces you picked out. How cool is that picture with the 3 pink girls? I shall seek a pastel pink winter coat and I shall direct anyone who questions me to this post. I've never been a pink person but i'm loving it at the moment! Hey there, loved your blog, just followed you on GFC (827), would you mind to follow back?